Nordic Edge Expo is located at the Stavanger Forum, one of the largest conference and exhibition areas in Norway with modern and flexible facilities, suitable for both small and large meetings, conferences, exhibitions, concerts and banquets. The airport express bus (please note: not all routes) stops by Stavanger Forum. Please see FLYBUSSEN for timetables and prices. 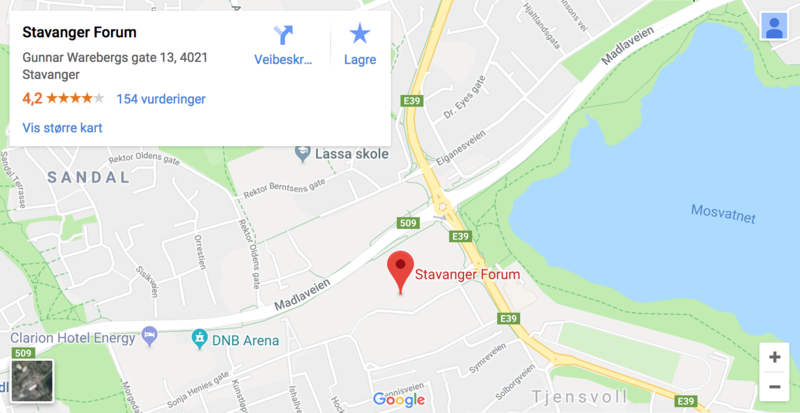 The stop for Stavanger Forum is called «Stavanger Forum / Tjensvollkrysset». Stavanger Forum is approximately 5-10min from Stavanger City Centre by bus. City Centre Bus Stop: Byterminalen / Breiavatnet to Stavanger Forum Bus Stop: Tjensvollkrysset - Bus numbers: 2, 3, 6, 7, 10 and 16. Please see KOLUMBUS for more information and prices. We recommend downloading the mobile app «Kolumbus Billett” to get the ticket cheaper. It is also possible to walk from the centre of Stavanger via the hiking trail through Mosvannet park. The trip takes approximately 30 minutes and is 3km in length. In addition, it is possible to rent an electrical bicycle in the centre of Stavanger and at Tjensvoll. Electrical Bicycles can be rented on an hourly or daily basis. Our mission is to build a Nordic ecosystem for smart, sustainable and liveable communities.